Earlier we showed you a bit about how the FMT puts the “sound” in the VIBRANT SOUNDBRIDGE middle ear implant, and now it’s time to do the same for cochlear implant. 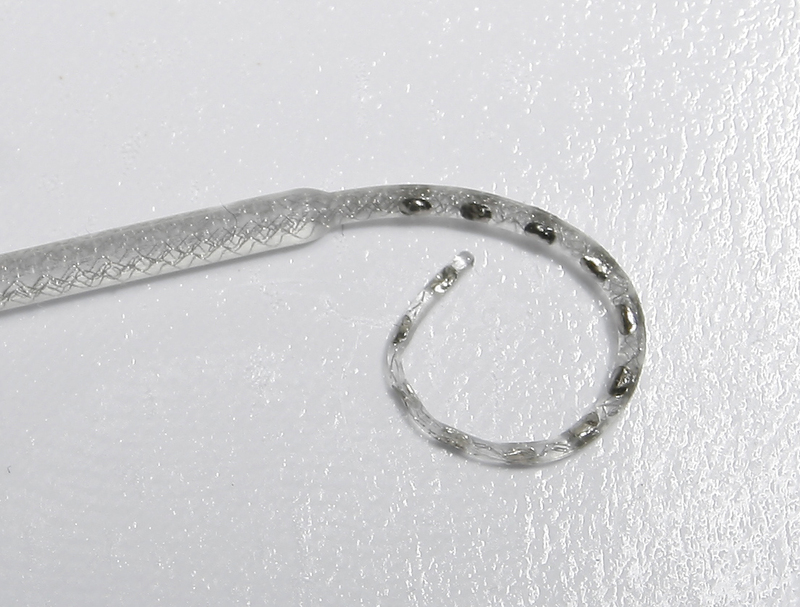 For a CI, it’s the electrode array that provides the pivotal connection between the implant and the cochlea. The electrode array is the bit of technology that sends electric signals from the implant device (like a CONCERTO or SONATA) to the cochlea. Earlier, we talked about how an electrode looks when it is inserted into the cochlea and looked at the history behind some of our electrodes. 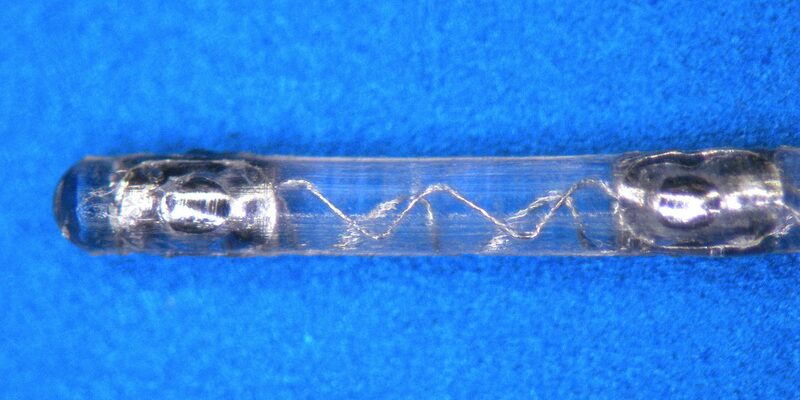 Now, let’s get up and close with a cochlear implant electrode array. First, what exactly is an electrode array? There are two prominent sections to a complete CI electrode, the electrode and the electrode array. On the far left are the beginnings of the wave-shaped wires, which will be connected directly to the electronics of an implant like the CONCERTO. On the right is the end of the electrode array, the part that is inserted into the cochlea. In between are a series of wave-shaped wires encased in silicon, approximately 100 mm in length to make sure that there is plenty of reach for it to get all the way into the cochlea. The electrode array is a special name for the part of the electrode that is inserted into the cochlea. 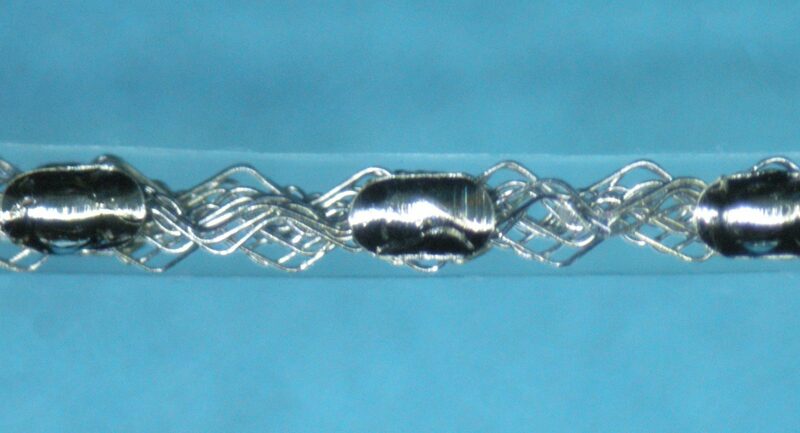 MED-EL electrode arrays vary in length from approximately 20 – 30 mm in length. 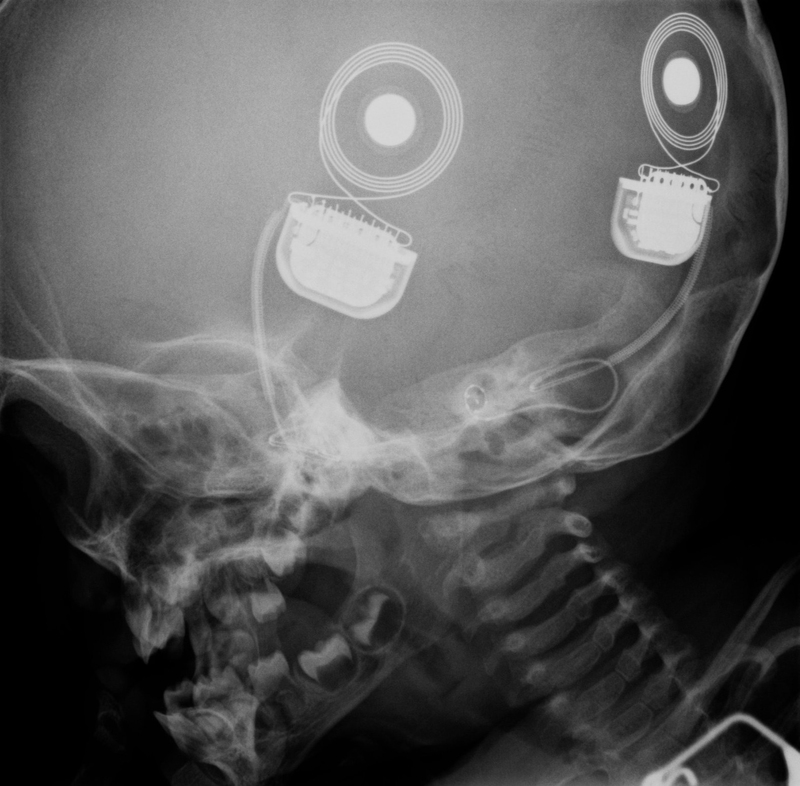 This X-Ray image shows a recipient with bilateral implants. You can see how the long length of the electrode array allows there to be plenty of room in between the implant and electrode array. 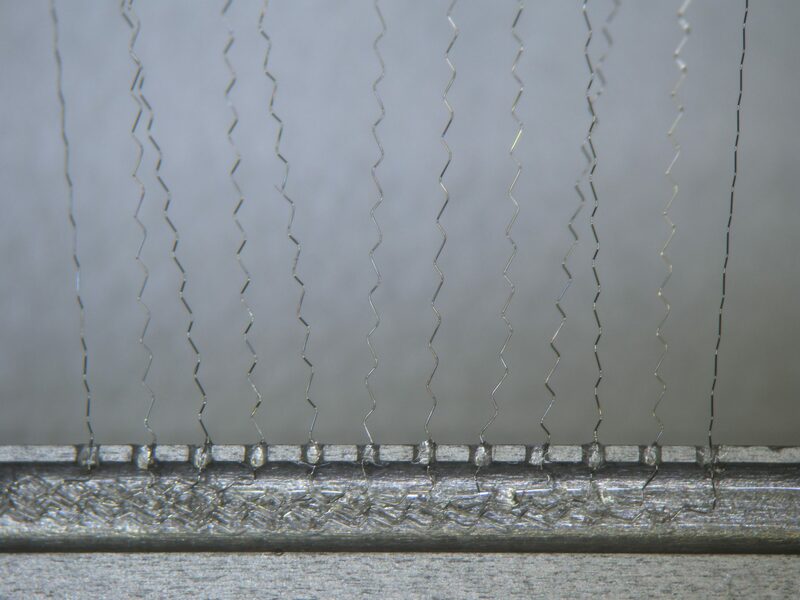 These wires go all the way through the silicon form until the far right of the electrode array, where they connect with the contacts that are located within the cochlea. It’s along these wires that the actual electric signals are sent and each wire is responsible for carrying one channel of sound. The wires and contacts are an alloy of 90% platinum and 10% iridium, two metals that combine to form a robust and energy-conductive wire. As we said above, the electrode array is the part that is actually inserted into the cochlea during a CI implantation. Here are some different MED-EL electrode arrays. Each array is shown in two positions, from the top (where you can see one set of contacts) and from the side (where you can see the two sets of contacts). There are some design features unique to each electrode array and we’ll get into exactly what those are in a later post. 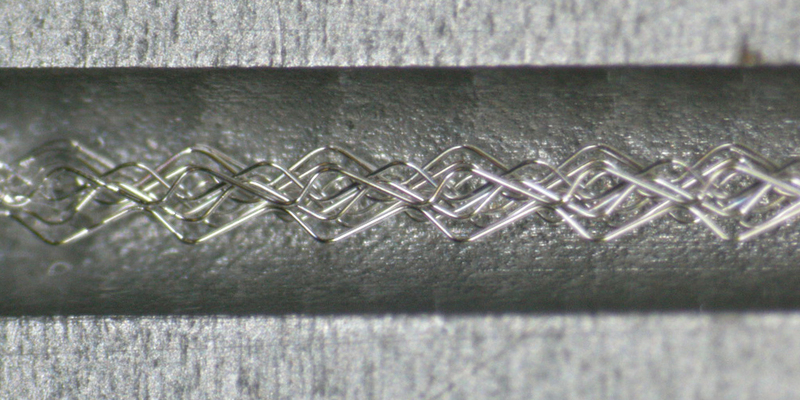 Like the wave-shaped wires, each contact is made of a platinum-iridium alloy. The contacts represent the only locations along the whole electrode where electrical current is able to pass from the electrode array to the cochlea. And here is what the very last electrode in an electrode array looks like. This is the electrode that stimulates the very lowest frequencies of sound (the bass) deep in the apical region of the cochlea. At this point, the electrode array is approximately 0.5 mm in diameter. We hope that you enjoyed this inside look into what a CI electrode looks like! If you want to learn more about a CI in general, why not visit the MED-EL website or watch some videos that explain how a CI works?